Just twenty-five minutes from the Port of Limon lays the privately owned Jungle Breezes Eco-Reserve: a biological paradise where you will discover a stunning profusion of Costa Rican tropical flora and fauna. La Jungla Trail offers a 1 km trek through a secondary forest offering beautiful landscapes, various flora and fauna, and including many opportunities to see the remarkably fascinating different frog species of Costa Rica, for example the red dart frog (dendrobates pumillo). 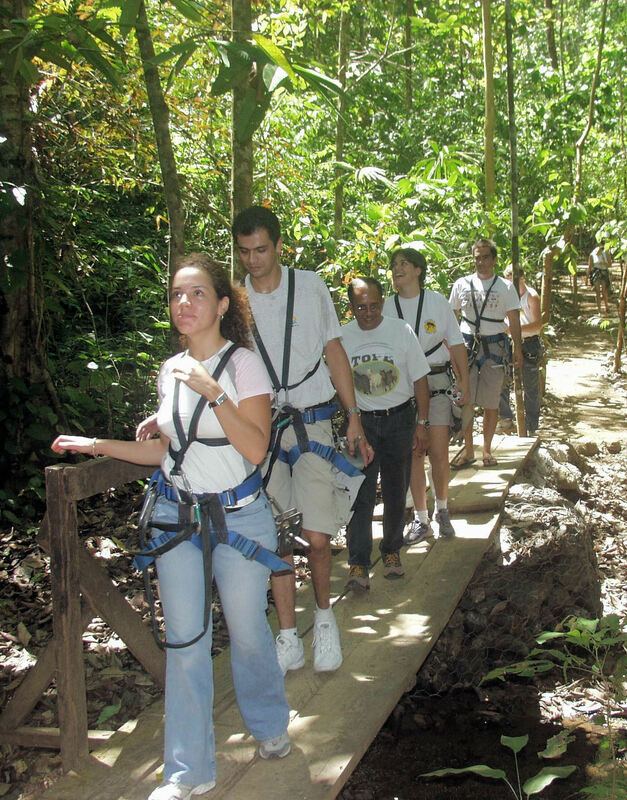 Inside the trail, among the abundant fauna visitors may witness the 3 toed sloths and see the different species of birds: Toucans, Oropendola, Tanagers, Hummingbirds, kiskidees and much more, squirrels, and the majestic butterflies that swarm through the trail. The creeks which appear during the trail, add a crisp freshness to the air, yet more importantly enable the reproduction of many of the organisms living there. For example these creeks create the perfect atmosphere for the various types of frogs you will encounter, allowing the perfect place for egg laying. You will witness the beautiful flora, such as the epiphytes, orchids and bromeliads as well as other ground level plants with various sized leaves appearing in their plenty. The different species of trees ranging from young to old, small to large, serve as homes to many of the creatures being large mammals to tiny insects. These trees as you will witness are also adorned by the lianas that hang from the branches. After this ecological tour, you will visit a banana plantation and packing house, where many interesting facts about this amazing fruit will be explained: The Crop, harvesting, processing, packing and exportation. Costa Rica is the second largest banana producer in the world and 80% of the plantations are located in Limon province, becoming one of the most important economical activities in the region. During weekdays, you will be able to see the workers doing their job in the fields and the packing house. A very interesting cultural experience that you can’t miss. It is recommended you wear comfortable shoes and bring sunscreen,a hat, sunglasses and mosquito spray. During rainy season, September through November, you might want to bring along a raincoat.